One month into the new year already! Exciting isn’t it. I find the start of the year a time of fresh beginnings and potential. Of course setting goals can happen any time of the year, not just January. If you have not set a goal for 2016, this post can help you work out out what you want it to be and how to set your goal. Over the years I tried a number of different goal setting approaches. I don’t think there is a one size fits all approach to goal setting, so what I share later in this post is what has worked for me, but does not mean it is the only way to successfully set and achieve a goal. Through these posts you can actually see the natural evolution my goal setting has moved through to where it is today. Most people set an intention or an ideal outcome and try to work towards it. That is great, but that is only half of the way there. I want you to pick an outcome and a process. Outcome: The ideal result, hopeful conclusion, best end for your goal. What did you want to do more of? There are some years, where when you look ahead to what it will encompass and it can guide you as to what a suitable goal will be. For example for me this year we have children in Year 12, Year 9, Year 7, Year 4 and Year 2. This is the first time we will be experiencing Year 12 and as with all firsts in parenting, I expect it to be a big year of learning for me as a parent. Year 9 we have done once before and I know it to be a year when boys really start their journey into adolescence bringing along with it significant pushing of boundaries and exploring new ideas and experiences. Year 7 we have done twice before, but this is the first time we have a daughter going through a first year of secondary school. It is also a year where they start to seek greater independence and define their own personality further. I have written on this blog, more than once, that as the primary carer in the family, I find the mood of the house is directly influenced by my mood. I feel it will be a big year emotionally as a parent with kids in Year 12, 9 and 7 and chose my goal for 2016 to reflect this. If you are like me, after just these two steps your head will be full of ideas. At this point write down everything you would like to achieve for 2016. Don’t hold back, list everything, this process can have a very calming affect – it gets those ideas floating in your head out into the world and on to paper. Are there any overarching themes in the goals? For me there was a definite theme of decluttering and slowing down in my goals, a definite feeling of less is more. In terms of images, it was clean lines and white, with neat borders – pretty self explanatory! I found last year having a short goal statement that I could repeat to myself almost a mantra truly helpful. In the midst of the day to day activities it is so easy to lose sight of your goal. 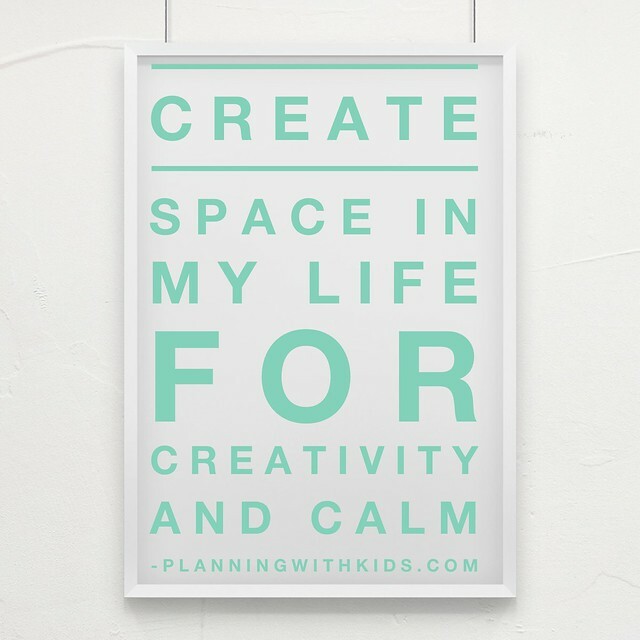 Being able to repeat to myself that I will create space in my life for creativity and calm, helps me focus on what really is important. It becomes the filter through which I can easily make decisions. When faced with a choice, I need to ask myself whether or not it will help me achieve my goal. If not then the answer needs to be no. Many people will state that they don’t have the self discipline to work towards their goal. To me self discipline is not the key but it is about creating the right habits to support your goal. This year I have 5 habits I will focus which you can see here. When creating a new habit or breaking an old one, it will indeed take discipline to stick to it in the early stages. Stick to it long enough however and it comes a habit. Once it is a habit you no longer have to think about it or exert mental energy on the discipline to ensure you do it. (I have written about this in greater detail Personal Motivation In Motherhood.) Work on creating the habits one at a time (more if they are only small changes) and see the positive knock on effect this will have in other areas of your life. I review my progress towards my goal each month here on the blog. The accountability I feel for having to turn up each month and write on my progress is a fantastic motivator to keep me on track. Find a way to keep yourself accountable, whether it be you write it down yourself each month or meet with a friend once a month to share how you are both progressing. You are much more likely to achieve a goal that is written down and shared. I will be sharing soon, some of the goals readers of the blog have set for 2016. If you have a goal for this year I would love to hear it. As I noted at the outset, there is no one way to set a goal/s for the year so please share below in the comments what your goal is and any advice you would have for other setting a goal for this year.